Math Word Problems Pro by Tapfun Inc. 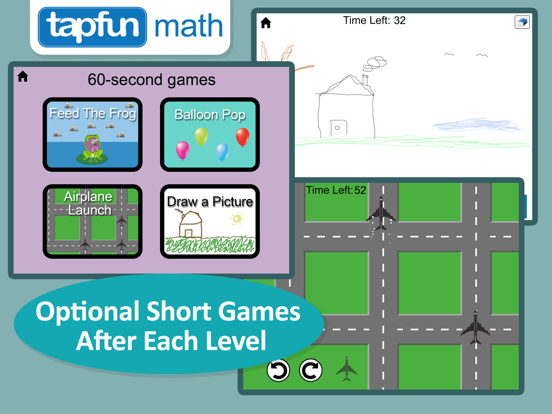 This app includes a wide variety of addition and subtraction word problems designed for students to listen, read, draw and solve. 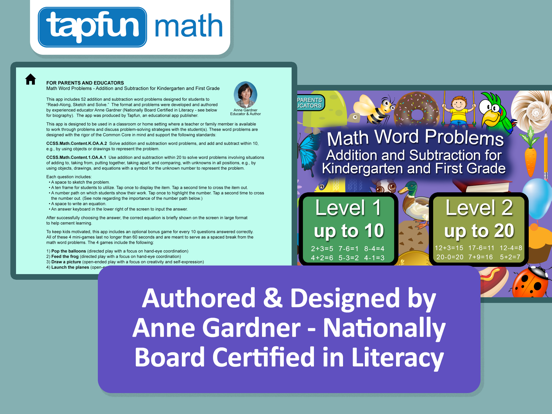 The format and problems were developed and authored by experienced educator Anne Gardner (Nationally Board Certified in the U.S. in Literacy - biography below). The audio narration was performed by Brad Mielke, a professional voice over artist with 18 years of experience. CCSS.Math.Content.1.OA.A.1 Use addition and subtraction within 20 to solve word problems involving situations of adding to, taking from, putting together, taking apart, and comparing, with unknowns in all positions, e.g., by using objects, drawings, and equations with a symbol for the unknown number to represent the problem. 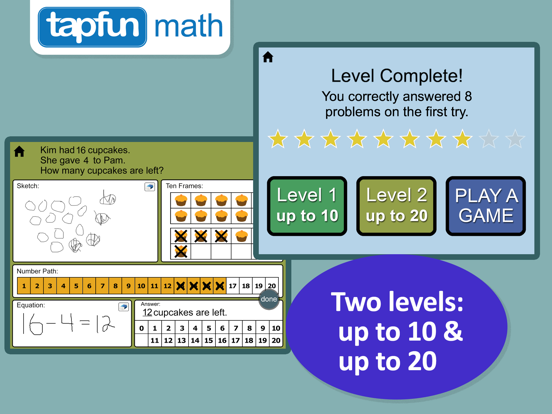 The app includes two levels: questions that go up to 10 and questions that go up to 20. • A space to sketch the problem and write the full equation. 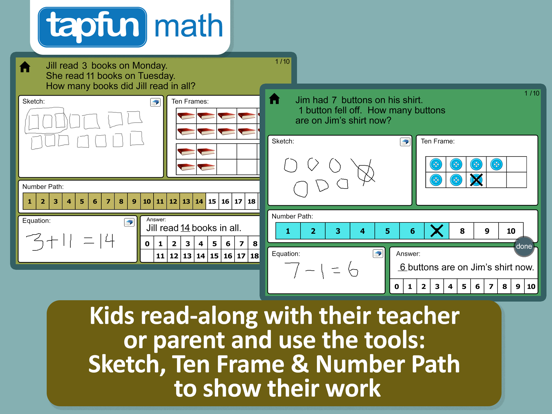 • A ten frame and number path for students to show their work. After successfully choosing the answer, the correct equation is briefly shown on the screen in large format to help reinforce the full equation. The app tracks how many questions out of 10 the students answer correctly on their first attempt. We’d love to hear how you are using the app in the classroom and/or home. contact@tapfun.com Thank you. Anne Gardner is a Response to Intervention Teacher in the lovely village of Newark Valley, New York. She earned a Master of Science in Early Education from Binghamton University. After working as a First Grade teacher for ten years, Anne was awarded National Board Certification in the field of Literacy. She has worked with students in Preschool, Kindergarten, First, Second, Third and Fourth grades. Anne strives to help each student become excited about learning as he/she develops strong reading comprehension and problem solving skills. This app uses a number path instead of a number line. Research has shown that number lines,which use a model of length,can be confusing for young children and often lead to the following common errors: Some children start their count with zero and are off by one. Some students count the space between the numbers. When they try to find the answer, their finger is between two numbers so they are not sure which number to choose. A number path is a counting model. Each number is represented within a rectangle and the rectangles can be clearly counted. 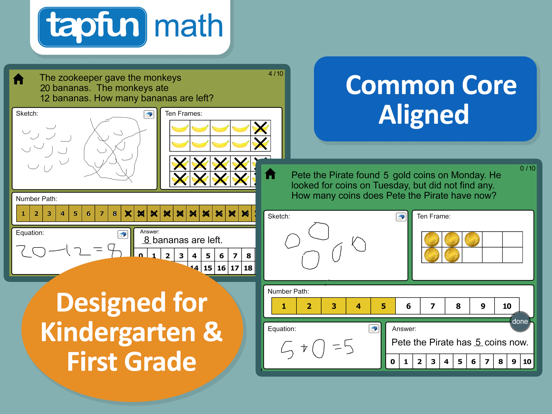 Further, a number path provides a more supportive model of numbers, which is important as we want models that consistently help students build confidence and accurately solve problems. Therefore, it is often best for students to use number paths, instead of number lines, until 2nd grade (Fuson, et.al., 2009). Thank you for supporting Tapfun. In this version we have improved the performance of the application for iOS 11.